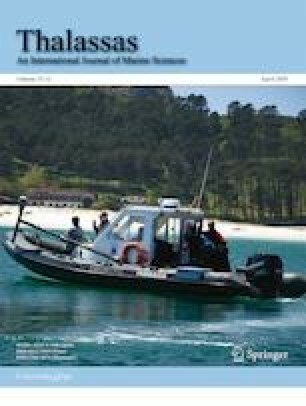 The aim of this work was to characterize the macrobenthic community of intertidal flats in southern Patagonia, by identifying the faunal assemblages and analyzing their relationship with the main environmental factors. The study was conducted in four localities of southern Santa Cruz (Argentina): Bahía San Julián (49°18’S, 67°41’W) and the lower reaches of the estuaries of Río Santa Cruz (50°05’S, 68°29’W), Río Coyle (50°58’S, 69°16’W) and Río Gallegos (51°37’S, 69°02’W). Surveys were performed in spring 2015 and summer 2016 at the upper, middle and lower intertidal levels. Four sediment samples were collected per intertidal level at each locality in each sampling period with a corer (0.00785 m2) up to 20 cm in depth. The organisms were separated using a 0.5 mm mesh sieve for subsequent identification and quantification. To explore possible spatial variations in the community, environmental and abundance data were analyzed using univariate and multivariate statistics. Intertidal level, substrate grain size and organic matter content were determinant factors of distribution of benthic assemblages. The Darina solenoides-Scolecolepides uncinatus-Eteone sculpta assemblage was characteristic of sand-mud substrates with dominance of silt-clay and greatest organic matter content of upper and middle intertidal. The D. solenoides-Ampelisca sp. assemblage was characteristic of the lower intertidal, with dominance of fine sand. The presence of saltmarshes was also a factor determining benthic assemblages at the upper intertidal of the estuarine localities. This work provides useful information to implement adequate management actions to protect the lower reaches of the Río Santa Cruz estuary. The authors thank Carlos Caminos and Raúl Fernández for their assistance in sampling, separation and quantification of organisms, D. Grima for preparing the map, and anonymous reviewers for their constructive and valuable comments and suggestions. This study was supported by the Universidad Nacional de la Patagonia Austral (PI 29A/333).